Turquoise was used in profusion in jewellery of the 19th century. The bright blue colour echoed forget-me-nots, which signified true love in the language of flowers used in sentimental jewellery. It was a popular gift to bridesmaids, often in the form of turquoise doves. In 1840, Queen Victoria gave her twelve bridesmaids turquoise brooches in the shape of a Coburg eagle, a reference to Prince Albert’s family. This necklace and the associated pair of earrings were given to Anne, Lady Hunloke (1788-1872) by William, 6th Duke of Devonshire (1790-1858). They are in a style which was fashionable around 1830 using turquoise, possibly from Russia and cannetille (rolled and twisted) gold . 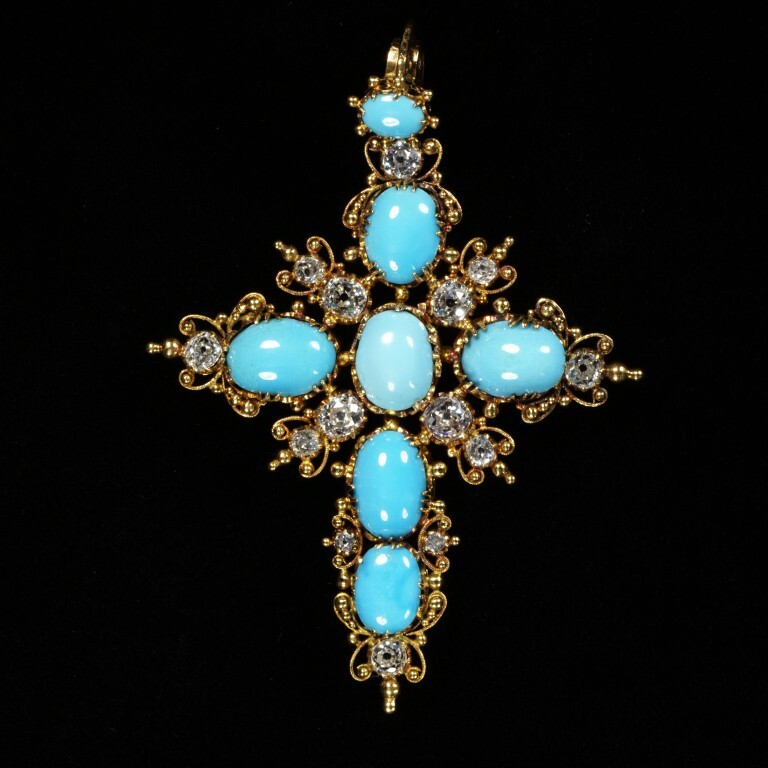 Necklace and pendant cross, gold set with turquoise and diamonds. The jewels (M.2:1 to 4-2001)were a present to Anne, Lady Hunloke (1788-1872), from William, 6th Duke of Devonshire (1790-1858).